Judy Gaudet’s poetry combines village communities and nature images to create a publication that is distinctly bred in Prince Edward Island. Born in 1949, Gaudet created a name for herself as a poet, but to many on her home island, she is also known as a mother, grandmother, genealogist, librarian, and teacher. Gaudet’s poetry work includes a chapbook, Poems, you say (Saturday Morning Chapbooks, 2003), and two full length poetry collections: Her Teeth Are Stones (Acorn Press, 2005), and Conversation with Crows (Oberon Press, 2014). Many individual poems from these works have been published in literary journals and anthologies, such as ContemporaryVerse2, The Poets of Prince Edward Island, Landmarks: An Anthology of New Canadian Poetry of the Land, Henry’s Creature, and A Bountiful Harvest: 15 Years of the Island Literary Awards. Various poems have been broadcasted on CBC Radio’s “Live Poets Society” and in online literature journals, including Sunday@6mag and The Windsor Review. 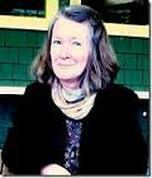 Judy Gaudet lives in Eldon, Prince Edward Island with her partner, David Helwig, also a poet. Published in Conversation with Crows. (Oberon Press, 2014). Judy Gaudet’s poem “Neap Tides,” found in her second poetry collection Conversation with Crows, expresses the need for change: within the self, society, and the world. The ocean clarifies this message by delivering the narrator an obvious – but hardly applied – truth: if she desires change, she may have to leave behind her desire for the world. However, when the poem is viewed through the lenses of desired change and elements of depression, readers will understand how although there is hope for change, the narrator’s fixation on what she does not have makes her incapable of accepting nature’s truth. Every aspect of “Neap Tides” evokes a desire for change. For example, the form of the poem is emblematic of physical neap tides, which flow with “least difference between high- and low- water levels” (OED). The poem’s long and short stanzas build and fall with minimal line variation, allowing distinct Prince Edward Island images to effortlessly carry readers from one stanza to the next. Although visually simple in form and imagery, the aesthetic ease welcomes the initial meaning of the poem: a desire for something more. The narrator places herself in the poem all “dressed up,” overlooking the ocean; essentially, readers understand that the narrator wishes to change (9). However, it is just as obvious that her longing is lost within the world’s material appeal, which keeps her stagnant: “without these shoes I’d leave this car/leave this earth” (13-14). Similar to the form of the poem, the literal meaning is approachably laid out for readers and furthered by the use of distinguishable repetitions of “If I weren’t…” (6, 9). These reiterated excuses clearly indicate a want for change; however, when readers move beyond the initial meaning, an understanding of the poem progresses beyond the façade of materiality to unveil the narrator’s hidden struggle. Just as physical neap tides show “least difference” between the high and low, the narrator’s life has little variation; but more than that, the narrator’s depressive elements keep her removed from her dreams. While the neap tides “press up to/roads and wharves,” nature’s potential to change forces itself against the narrator to signal its availability; but, the narrator fails to notice (2-3). Furthermore, the poem uses “bracken” – which grows in “masses” and indicates the “collective desire” of an individual – to represent the narrator’s awareness of her opportunity to re-enter the community from which elements of depression forced her to partially withdraw from (OED, 7). Even the sky, which “lowers” to “fill the space” in order to ease the transformation, is unable to break the narrator’s depression and fear for change (4). Yet, despite her desire, the narrator loses her ability to accept nature’s obtainable change. While elements of depression can be seen in “Neap Tides,” the narrator’s inability to move towards her dreams is heavily influenced and excused when she creates worldly justifications: “if I weren’t wearing a skirt,” “if I weren’t dressed up,” “without these shoes” (6, 9, 13). These practical reasons for remaining in her current state take over the evident dream of being able to “fly down along the edges/of cliffs, across the whitecaps” (11-2). Ultimately, the narrator wishes to “leave this earth” (11-12, 14). Yet, regardless of the opportunities nature hands the narrator to aid in the process of change, she cannot physically nor emotionally muster the courage to change. Judy Gaudet’s “Neap Tides” provokes metaphors for, and suggests ways to alleviate, not only depression but the general struggle of personal, societal, and worldly change. While Conversation with Crows, as a whole, carries readers on a journey of accepting nature’s message of change, this particular poem speaks of one’s occasional hostility towards change. Throughout “Neap Tides,” Gaudet’s relatable images speak of transformations, but contrast such a desire with the constant oppositional pull of worldly desire and suffering. Gaudet points out that although messages may be heard and desired, it is sometimes harder than one would think to trust, understand, and grasp nature’s valuable lessons. Gaudet, Judy. “Neap Tides”. Conversation with Crows. Ottawa: Oberon Press, 2014. Print. Gaudet, Judy. "Clams." Windsor Review. 33.1 (2000): 59. Print. ---. Conversation with Crows. Ottawa: Oberon Press, 2014. Print. ---. Her Teeth are Stones. Charlottetown: Acorn Press, 2005. Print. ---. “Neap Tides.” Contemporary Verse 2: The Canadian Journal of Poetry and Critical Writing. Winnipeg: Contemporary Verse 2, Inc., 2010. Web. 28 Jan. 2015. ---, ed. One Hundred and Fifty Plus: Canada's History in Poems. Charlottetown: Acorn Press, 2018. Print. ---. Poems, you say. Montague: Saturday Morning Chapbooks, 2003. Print. ---. "Winter Evening." Windsor Review. 33.1 (2000): 60. Print. “Almost taking it in by Judy Gaudet.” Sunday@6 mag. Magazine for the literary arts, n.d. Web. 28 Jan. 2015. Bell, Roger. Henry’s Creature: An Anthology of Poems and Stories About the Automobile. Toronto: Black Moss Press, 2000. Print. “Judy Gaudet.” The Prince Edward Island Poet Laureate. peipoetry.com, n.d. Web. 28 Jan. 2015. “Judy Gaudet.” Windsor Review. University of Windsor, n.d. Web. 28 Jan. 2015. MacDonald, Hugh. A Bountiful Harvest: 15 Year of the Island Literary Awards. Charlottetown: Acorn Press, 2002. Print. MacDonald, Hugh. Landmarks: An Anthology of new Atlantic Canadian Poetry of the Land. Ed. Brent MacLaine. Charlottetown: Acorn Press, 2001. Print. “Poetry: Judy Gaudet.” Famous Reporter. Walleah Press, 2009/2010. Web. 28 Jan. 2015. “Semaphore: Judy Gaudet.” National Poetry Month. League of Poets, April 2013. Web. 28 Jan. 2015. Wright, Wayne. The Poets of Prince Edward Island. Charlottetown: Ragweed Press, 1980. Print.